Ballardian Architecture. It’s a thing, so I’m told. And I don’t doubt it. He did so love to explore the psychologies of gated communities, and the utilitarian, Brutalist monstrosities such as La Défence and Trellick Tower (particularly, given fictional architect Anthony Royal is likely an avatar of Trellick’s architect Erno Goldfinger, who rumour has it was turned into a Bond villain as a result of his building an awful modernist house near to sometimes-Hampstead-neighbour Ian Fleming, but did, in fact, live in the penthouse suite of the nearby Balfron Tower for a few months, before moving out). 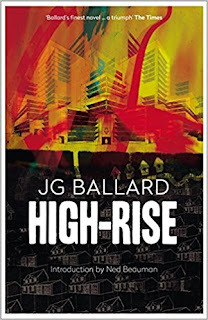 High-Rise itself is the fourth in a tetralogy of early explorations of such structures and their communities. In his last, loosely grouped tetralogy, Cocaine Nights, Super-Cannes, Millennium People, and Kingdom Come he returns to this thematic exploration and the types of people who choose to live in these communities. Indeed, anyone who has seen recent series like The Wire or films like the turgidly self-satisfied 2012 reboot of Judge Dredd will have an insight into the bizarre worlds of towering rectilinear habitations. The book opens on a scene where Dr Robert Laing is casually eating an Alsatian, stuffed with garlic and herbs (“"One rule in life", he murmured to himself. "If you can smell garlic, everything is all right".”), cogitating thoughtfully on the state of things. Over the course of only three months, we see through the eyes of the three Freudian protagonists/antagonists (film director Richard Wilder representing the id, Laing is the ego and the building’s architect, Anthony Royal, who lives in one of the penthouse apartments, is the super-ego) as the residents, in part as a consequence of service breakdowns and the resultant inequality of privileges across the various strata of the building, form tribes, build defences, create raiding parties, and generally indulge in every form of sociopathic behaviour imaginable. Attacks on property quickly escalate into sexual and physical assaults, people are thrown from balconies, and Wilder fights from floor to floor and from female to female in an attempt to reach the penthouse and a reckoning with Royal. This is pre-Thatcherite augury, a twisted dystopian sci-fi shocker. 40-odd years on and it still possesses the power to horrify and intrigue in equal measure, and forgetting if not forgiving the recent, art-school-type film adaptation, its relevance to the debate over the design of our habitat is as important now as when Ballard was reading Jane Jacobs in the sixties.